Quick and easy buttery flaky scallion pancakes recipe, lightly brushed with miso for a layer of umami and packed with scallions and sesame seeds with step by step instructions on how to roll them out. Before we start, I want to state that these scallion pancakes (aka green onion pancake) are not made completely from scratch. 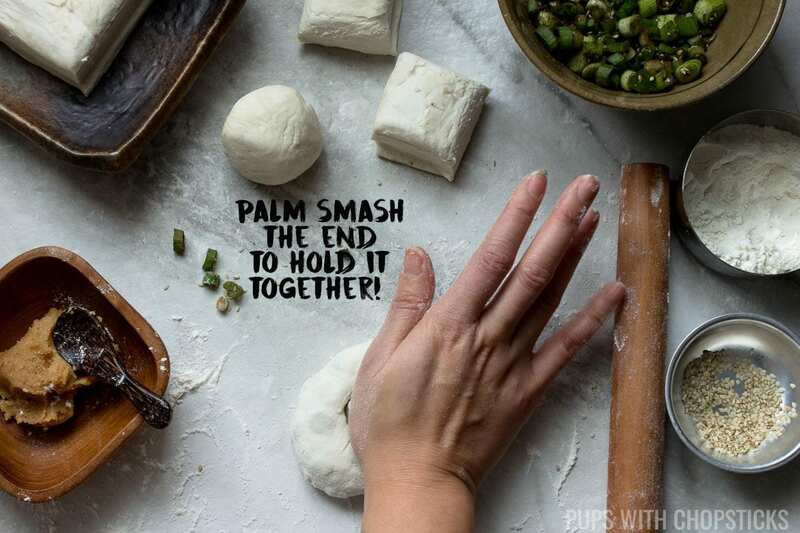 I cheat with this one and use pre-frozen puff pastry so I can save the step of making my own dough. That being said, this scallion pancake is more flavorful than the traditional scallion pancakes because of the layer of miso. It is also more buttery as well because we are using puff pastry. 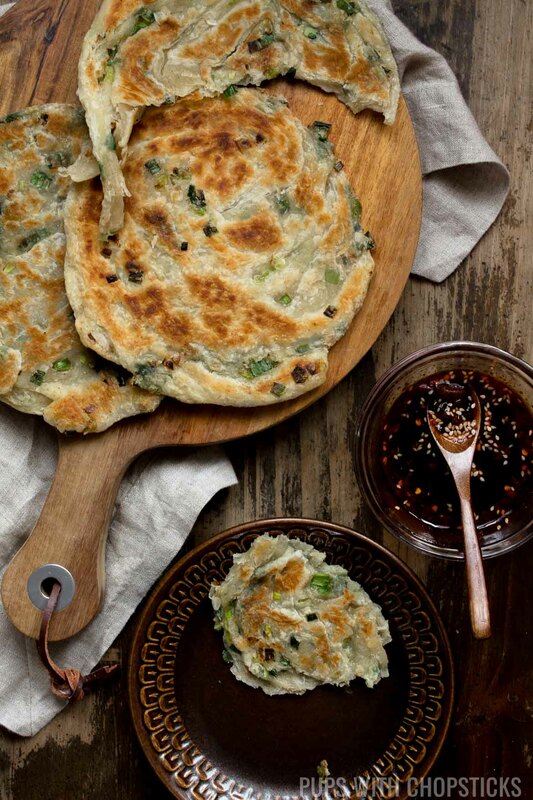 All ingredients for these Scallion Pancakes can be found at your local grocery store. If you cannot find miso at your local grocery store, you can find it at an Asian grocery store or online. To add a bit more flavor to the scallions, I like to marinate it a little in sesame oil and five spice. I usually sprinkle the sesame seeds directly onto the pancake before I roll them out but to save a step and some time I will occasionally add the sesame seeds directly into the scallions. 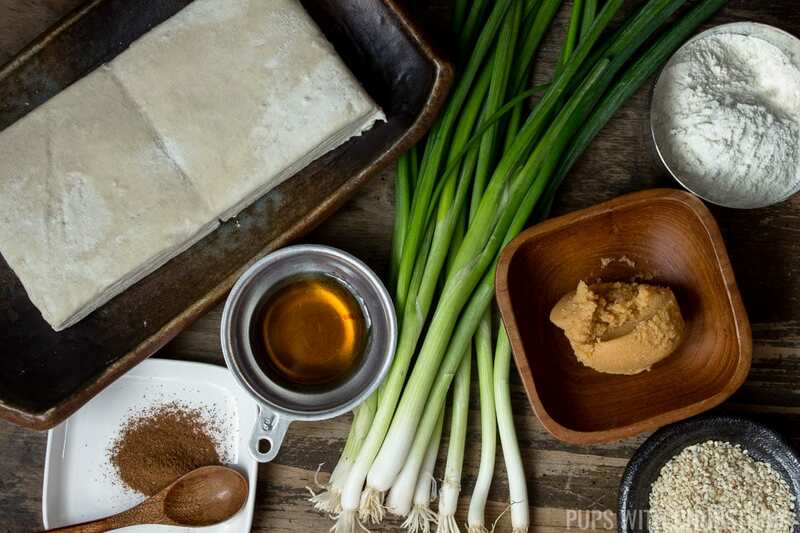 Although miso is not a traditional ingredient used in scallion pancakes, lightly brushing miso onto the pancake before rolling it out gives the scallion pancakes more savoriness and adds a layer of umaminess. Just make sure you thin out the miso paste slightly with a bit of water before lightly brushing it on so it glides easier across the pancakes. 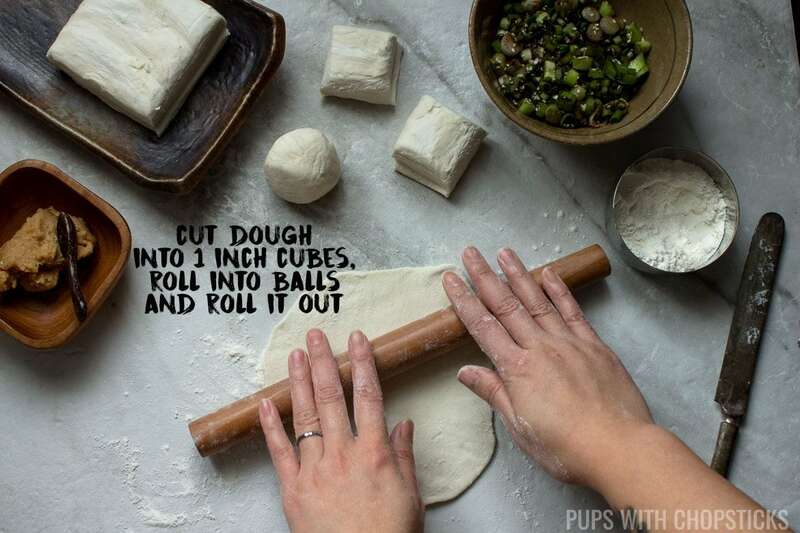 Defrost the dough in the fridge, and not in room temperature – this will give you a firmer dough to work with and it will be less sticky as well. Don’t be afraid to dust the rolling pin and counter with flour to prevent the pancake from being too sticky, while you are rolling out the pancakes. 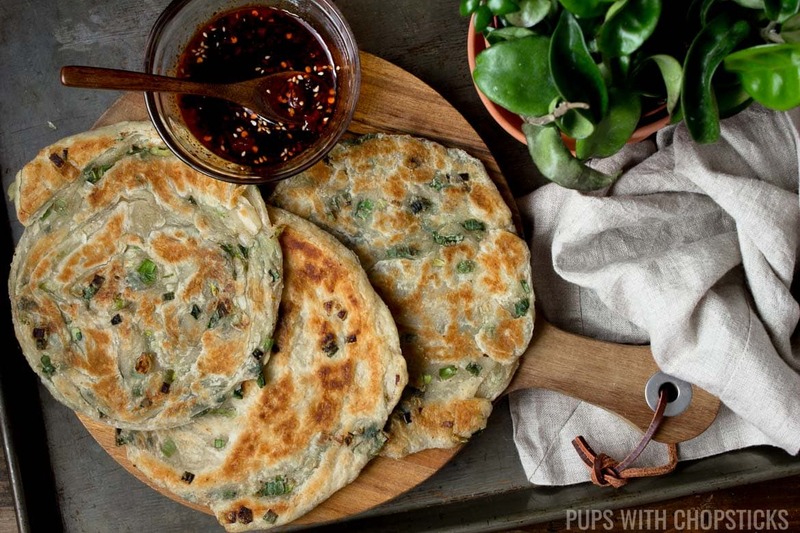 Can You Freeze These Scallion Pancakes? Yes you can! Just make sure to keep each pancake separated with a sheet of parchment/wax paper and when you store them make sure you seal them really well so they don’t dry out. I like to keep a stack of them in the freezer in a ziplock back with the air squeezed out. You can also keep it in the fridge this way too. If you are cooking them straight from the fridge, the instructions are the same as the recipe. 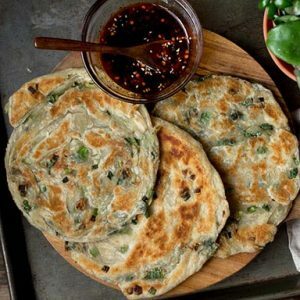 If you are cooking these scallion pancakes from the freezer, you can put the frozen pancake directly onto an heated oiled frying pan but add 1-2 additional minutes to the cooking time to crisp it up more. Plain Japanese Mayo – Simple and tasty! 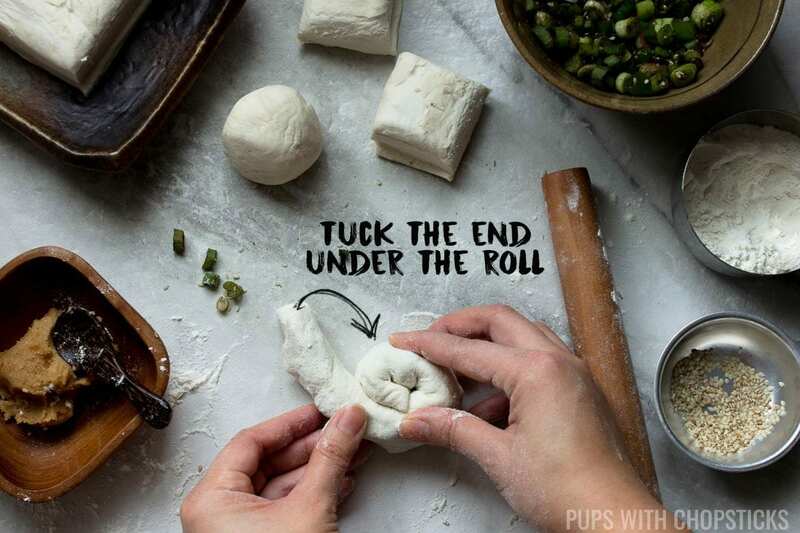 Defrost the puff pastry in the fridge for 3-4 hours or the night before. Dust the counter top and rolling pin lightly with flour and roll out the pancake thinly again (approximately 1/8 inch) A thinner pancake makes a crispier and less doughy texture. Place it on a piece of parchment/wax paper and repeat the process with the rest of the dough balls until all the pancakes have been made. In a frying pan, put a bit of oil to coat the bottom and set the heat to medium low. When the oil is hot, add 1 pancake in and toast it for 3 minutes each side (for a total of 6 minutes), or until they look golden brown and crisp. 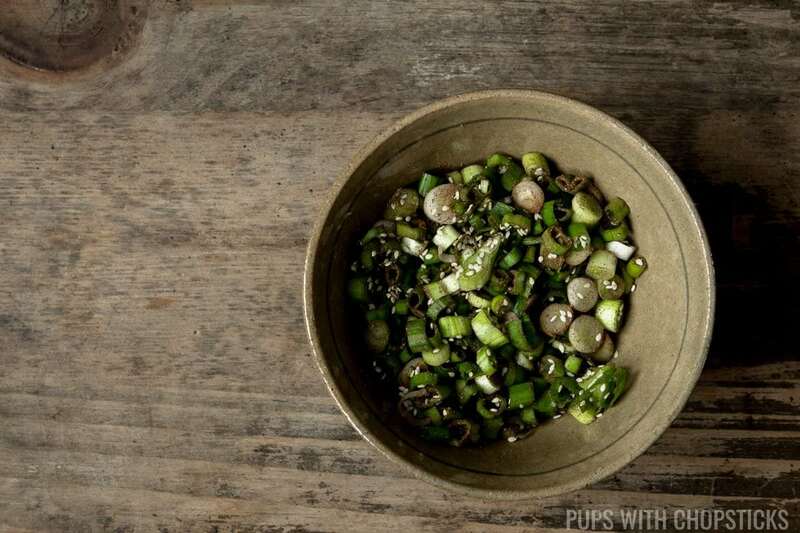 Remove it from the pan, serve it whole or cut into quarters – plain or with a dipping sauce. These pancakes can be stored in the fridge or frozen once they have been made. Make sure you have a layer of parchment paper or wax paper between each pancake and keep it well sealed so it doesn’t dry out in the fridge or freezer. I like to keep a stack of them in a ziplock bag (with the air pressed out), when I make a lot ahead of time.If you are cooking them from the fridge, the instructions are the same. If you are cooking them from the freezer, you can add the frozen pancake directly into the frying pan – add 1-2 additional minutes to the cooking time to crisp them up. If you are serving these at a party or gathering, you can pre-cook the pancakes and reheat them in a pre-heated oven at 375F (190C) for 5-6 minutes, flipping them at the 2-3 minute mark. This will crisp it back up. 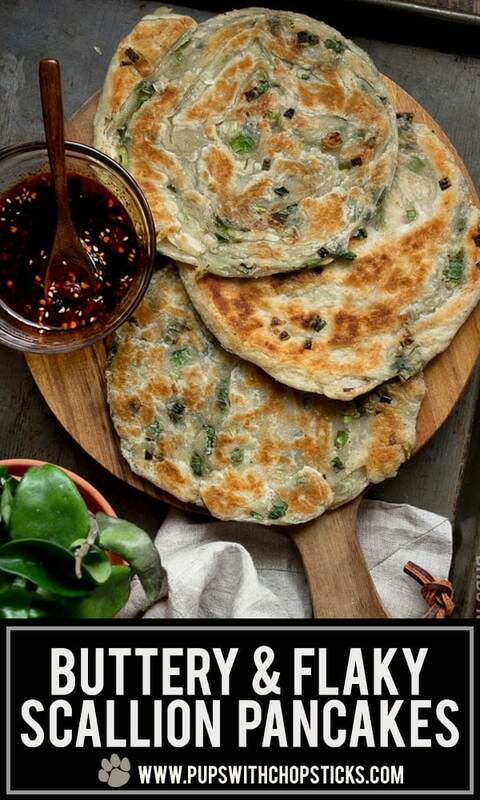 I literally want to reach through my computer screen, grab every last one of those delectable looking scallion pancakes, and stuff them all into my mouth – they look SO DANG GOOD! And I seriously love you for using puff pastry; I’m always turned off by the amount of work when I have to make dough from scratch. Your scallion pancakes look so easy, especially thanks to your stellar step-by-step photos (seriously, you have some of the best I’ve seen on the Internet). 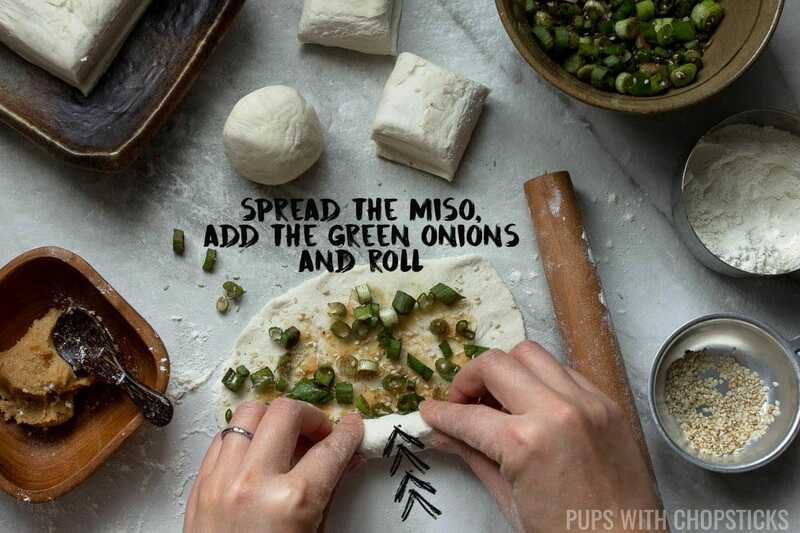 And adding a layer of miso to them? BRILLIANT!! I am soooo excited to try making these, along with the sauces you suggested. What vegetarian items would you say go well with these? It’s funny, dough freaks me out. It’s very intimidating to me too. I will occasionally bake a bread but I usually just break all the rules and throw everything together and hope for the best haha so I know how you feel. 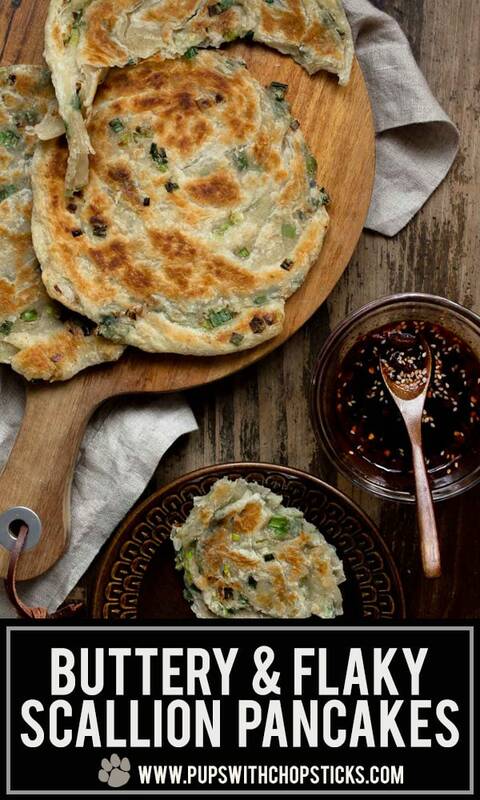 I love this great Scallion Pancake. Delicious and tasty ! I like to fry it to more golden brown to give it a more crispy texture. My whole family love this pancake. Especially my kids love the most, asking to pack this for his lunch. Thank you , Joyce, I made it. I’m thinking Mu Shu pork or chicken. Are they flexible enough to use as wraps? Do they freeze? And how would you reheat them after refrigeration or freezing? Yes these freeze very well in the freezer and also do well in the fridge as well. Just make sure you have parchment paper/wax paper between each pancake and make sure it’s sealed well so it doesn’t dry out from the cold. If you are cooking them from the fridge, I would treat it the same as if you cooking them fresh. If you are cooking them straight from the freezer, you can actually just put it straight into the frying pan frozen. You may need to cook them 1-2 minutes more if you want it crispier but I have made these directly from the freezer without cooking it for an additional 1-2 min on top of my usual instructions and they turned out fine as well. These are sorta flexible. 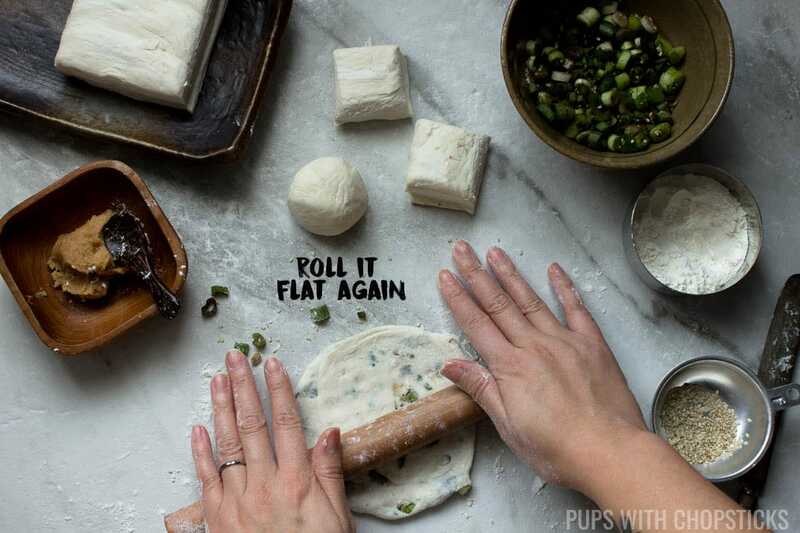 You can definitely wrap with it but the parts that are flaky and crispy will not flex, and will slightly crack – the middle of the pancake will still be intact to hold the foods though but sauces may seep out if it’s runny. Hope that makes sense? If you don’t mind a bit of a mess then I would go for it! I know I definitely am! 😀 But also keep in mind that the pancakes are also buttery so a bit on the heavier side so 1-2 pancakes is very filling. Can the pancakes be made in advance and stored in the fridge? You can definitely make these in advanced and keep them in the fridge. Just make sure you have parchment paper or wax paper between the pancakes and make sure it is really well sealed before putting it in the fridge so they don’t dry out. I like to make a stack of them (with parchment paper in between) and put it in a large ziplock bag, with the air squeezed out of it as much as possible before storing it in fridge. That’s such good news! Thank you for your reply.